Detail, Phipps Garden Apartments in Sunnyside, Queens (New York City). Photograph by Paul Shaw (2008). 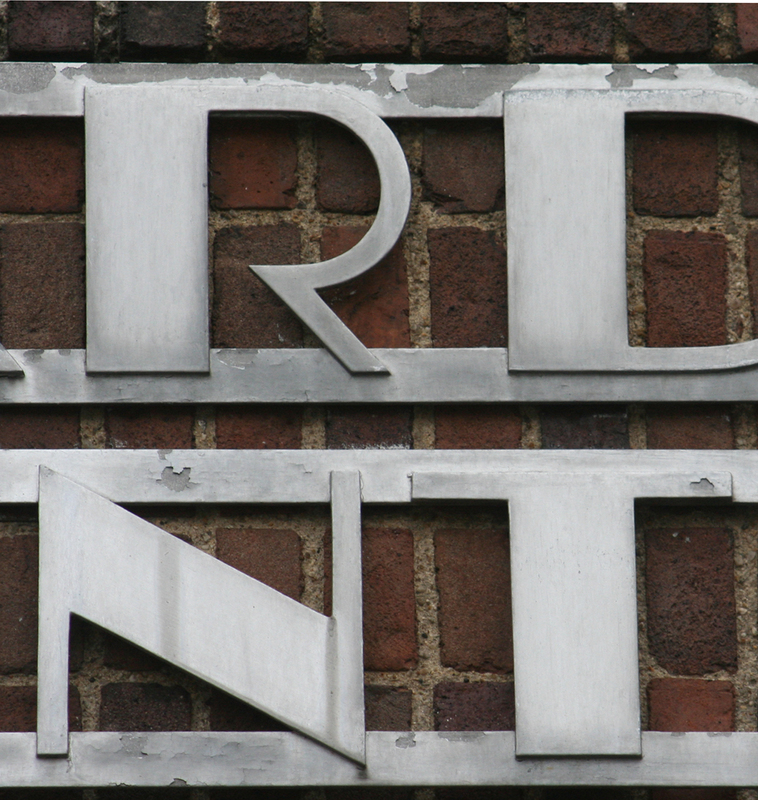 This Art Deco R is from a sign at the Phipps Garden Apartments in Sunnyside, Queens (New York), a housing complex that was built in response to the garden city movement begun in England at the turn of the 20th century following the theories of Ebenezer Howard. The movement, in response to the rapid shift in population to urban areas in the 19th century spurred by industrialization, sought to create housing that integrated town and country. The most famous example of this in metropolitan New York is Sunnyside Gardens, built between 1924 and 1928 by the City Housing Corporation (developer Alexander Bing and architects Clarence Stein and Henry Wright with much advice from literary critic and early urbanologist Lewis Mumford). The nearby Phipps Garden Apartments were built in the 1930s by the Phipps Foundation, begun in 1905 by industrialist Henry Phipps who sought to create quality housing for the working poor. The ﬁrst buildings, designed by Clarence Stein, were completed in 1931. The landscape architect was Marjorie Sewell Cautley. Phipps Garden Apartments, Sunnyside, Queens (New York City). Photograph by Paul Shaw (2008). What Phipps has that Sunnyside doesn’t is wonderful metal Art Deco signage. The letters fit into a trend in the 1920s of taking 19th century Fat Face types, stripping them of their serifs but keeping the neoclassical thick/thin relationships, and then, in cases like this, adding elements that suggested the machine age. The letters are very similar—note particularly the H, M and N—to the ubiquitous Broadway typeface by Morris Fuller Benton (American Type Founders, 1928), though the jagged S is closer to that of Ultra-Modern Bold (Douglas McMurtrie, Ludlow, 1930). However, the Phipps letters are wider than either typeface and the R has a distinctive open bowl. The metal strips that the letters are attached to are not only functional but they are an integral part of the overall Art Deco appearance of the sign. The silvery metal color and the elongated layout are part of the shift in the early 1930s of Art Deco toward a “streamline” aesthetic spurred by architects such as Raymond Hood and early industrial designers such as Raymond Loewy, Walter Dorwin Teague and Henry Dreyfuss. 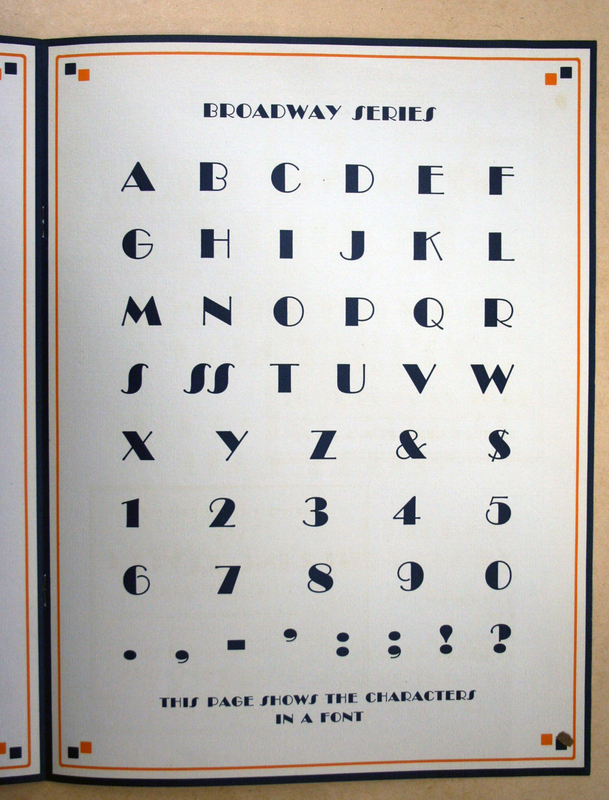 Character set for Broadway (Morris Fuller Benton, American Type Founders, 1928). The Phipps R and those in Broadway and Ultra-Modern Bold are typical of Art Deco letterforms, whether drawn for posters, magazine covers or advertising or made into typefaces. Its features are exaggerated with an overly large bowl and an extreme contrast of thick and thin strokes. It is the notion of exaggeration—excessively high or low cross strokes, mixed wide and narrow letters, unusually tall ascenders, drawn out legs of R and tails of Q, and so on—that distinguishes Art Deco lettering more than any presence of ornament. This emphasis on exaggeration puts Art Deco lettering in opposition to classical lettering with its focus on harmony and balance. Whereas the goal of classical lettering is calm and quiet authority, Art Deco lettering aims for vivacity and surprise.